“Six-year-old Grendimar was so thin that you couldn’t see her in bed. When I bathed her she was all skin and bone”, says Yusmarely. The mother-of-three thanks Caritas for the fact that all her children are playing and smiling again. 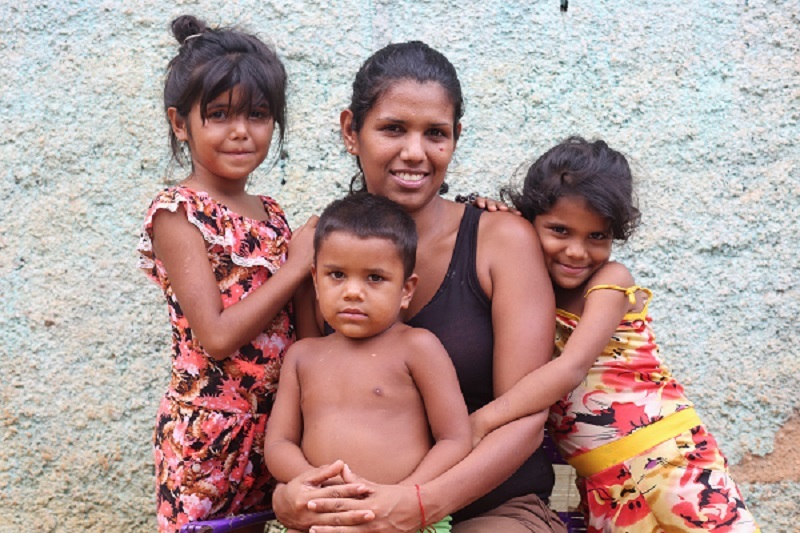 Yusmarely lives with her three children in Tomuso, Venezuela. Economic crisis and high inflation have undermined the population’s purchasing power and the young mother struggles to find enough food for her family. A bag of corn flour, used to make the Venezuelan dish arepa, can cost as much as half an average monthly salary of $1.50. Every day prices go up. One kilogram of eggs can double in price in just a few days. At one point, her six-year-old daughter Grendimar became so thin that she cried and slept all day. The food shortage caused the waistlines of the whole family to shrink and Yusmarely grew worried about the children’s health. Fortunately, they found hope nearby. Every week, the local Caritas organisation arranges health checks for children under the age of five. Grendimar was above the age limit, but that didn’t stop Yusmarely from taking her and three-year-old Greivis there to ask for help. Caritas volunteers weighed them, measured the circumference of their left arm and concluded that they needed treatment with dietary supplements due to malnutrition. In recent months, the children have changed. “What Caritas has done is amazing. I’m so happy when I see Grendimar having lots of energy. Every day she gains weight.” Yusmarely no longer worries about whether Grendimer’s clothes will fall off, but she has a new concern. The crisis in Venezuela has worsened dramatically in recent years. Millions of people have ended up in abject poverty. Last year, three universities in Venezuela investigated the public health situation in the country. The results showed that the average weight decreased by eleven kilos in 2017. Caritas Venezuela warns that as many as 200,000 children are in danger of dying of hunger. With support from the Ministry of Foreign Affairs of Norway and in collaboration with Caritas Venezuela, Caritas Norway has started an emergency programme for 3,500 children under the age of five and 800 pregnant and breastfeeding women. With your support we can help even more!